You know when you make a quick toile from whatever nutty fabric you have lying around and end up loving it just as it is? I think this is one of my favourite makes EVER and it was just meant to be a practice! As I’m sure you can tell by that unique bodice, this is the Centaurée, the newest pattern from Deer & Doe. I couldn’t resist it after seeing so many pretty ones popping up after the sewalong. 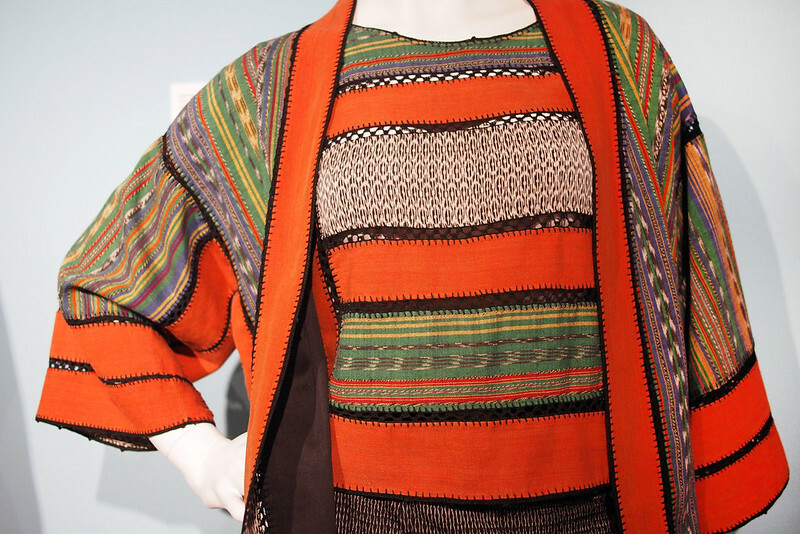 So many opportunities for fun print placement and colour blocking – some things I’ve been really keen to explore more. With such an unusual bodice, making a toile is a must. For mine I used some crazy large-scale jewel-printed fabric that I’ve had hanging around for ages. It was from Ikea many moons ago but I couldn’t convince Josh to let me use it for curtains (can’t imagine why). Its home-decor weight and rough canvas texture means it’s definitely not a dressmaking fabric, but you know what: I really love the effect of it on the Centaurée! The fractured print across the seams looks really cool and I think the stiffer fabric gives it some nice structure. I used ‘proper’ construction and finishing techniques rather than just basting it all together, so it’s definitely a wearable toile. Plus I was surprised to find that the toile fitted me nearly perfectly straight off the bat! D&D apparently design for my exact body shape and bust size which is good to know. It was just a bit too big all round so I sewed the side seams with a larger seam allowance and shaved about 1.5cm off the bodice back. Next time I may just size one down all over as I still have a little bit of wrinkling at the sides. I decided to criss-cross my straps over in the back to complement the front seams, and I’ve stitched down across the intersections to make them stay in place. Love how this turned out. The construction is fascinating and clever, with the upper diagonal seams curved to give the bust some space rather like a princess seam (the sewalong has some tips on how to adjust for a bigger or smaller bust). Yet it’s very quick to make up and not difficult – you just want to take a bit of time to make sure the star-shaped front seams all match up nicely and to stitch the bias binding trim accurately. Talking of binding, the instructions have a brilliant foolproof technique for getting a nice mitred point at the centre front – if this sloppy sewist can get it that neat, anyone can! I love how the straps are a continuation of the binding, so very easy to sew and adjust the length to suit. Lining is not included as part of the instructions, but I lined my bodice with my favourite stretch mesh. The stretch means I didn’t bother piecing it: I just pinned the constructed outer bodice directly onto my mesh and cut around it. 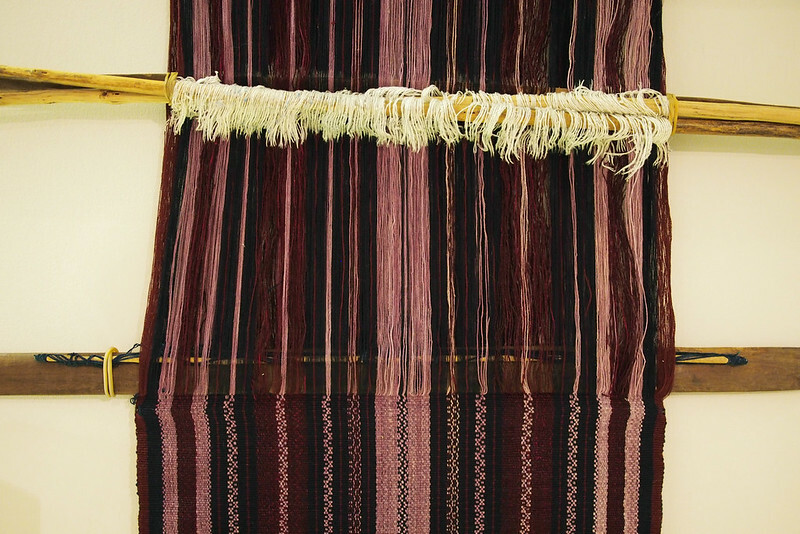 If I was using a woven for the lining I’d make a direct copy of the outer and baste them together. I think I would always line the bodice because the seams wouldn’t feel that nice against the skin. It closes with a side zip – not my neatest, and i only had a regular zip to hand instead of the recommended invisible, but it does the job. 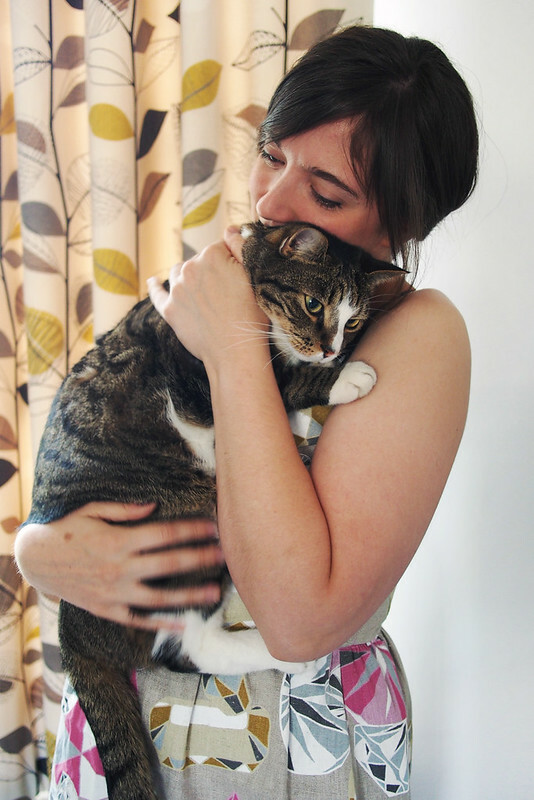 Gratuitous cat cuddle photo, dawww. Now that I know the Centaurée fit is a winner, I can see me churning out a good few of these for summer. The next one will definitely use my Graham Coxon Liberty print, probably with a contrast panel or two of matching grey crepe so it’s not pale all over. I’ve been photoshopping to get an idea of how I could block it and can’t decide which I like best – what do you think? 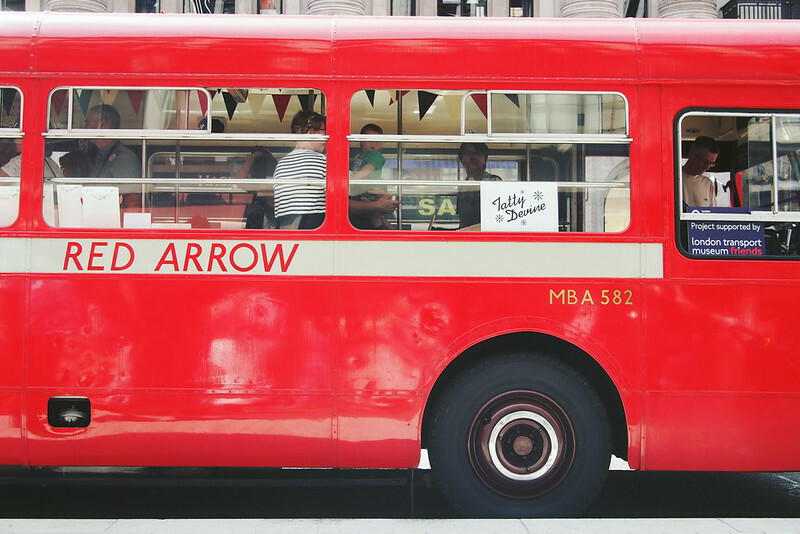 The whole of Regent Street was taken over with vintage and new buses to celebrate TFL’s Year of the Bus. There was even a bus stop entirely made of Lego. So cool. Your dress is lovely! I love the colours and LOVE that black trim. I think the trim makes it for me! Cool photoshopping. What a neat idea. I would never think to do that. I like the last version best and the middle one comes a close second for me! Thanks! I love the graphic black trim as well. I love when that happens! your toile looks great and that print is so fun. I really liked the middle version of the color-blocking. I can’t wait to see what one you choose! It’s such a winner! That fabric is amazingly amazing! I think out of the 3 photoshopped options I like option 1 the best. You’ve done a great job finishing this dress off so beautifully. Nice work. Thanks! I have no idea how this fabric will wear and wash but I did my best. I remember that fabric from Ikea! 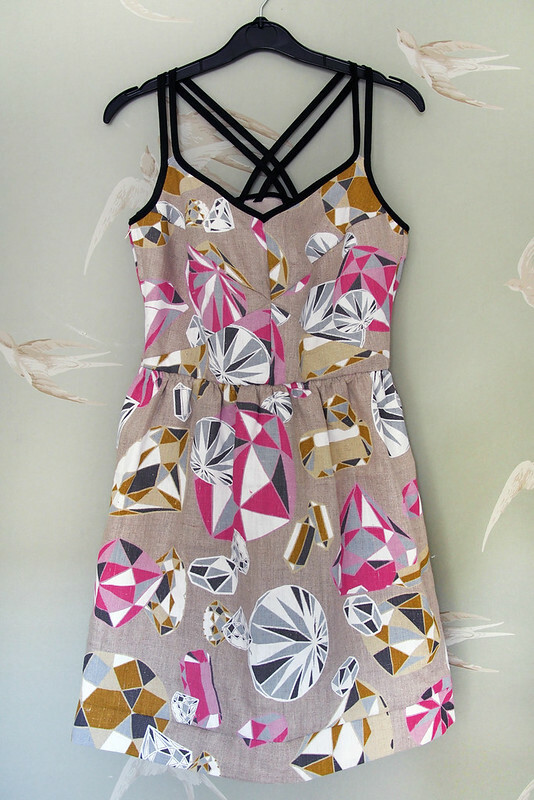 What a cool dress, I would have never tried it in a canvas-like fabric but it works so well. Congrats! I like the first of the three dress versions best, it shows the fabric best and breaks it a bit apart, also enhances the waist and bust. Looking forward to seeing it! Thanks! I think I’m leaning towards the first one. I love the bold print on this dress and I definitely agree that the stiffer fabric gives the Centaurée a great structure. I think the photoshopping is a great idea, for me it has to be to be the last one. I’m looking forward to seeing your next version! Love the crazy fabric centauree! Wish I was braver with prints and colour. In your Photoshop centauree versions I like the first the best, followed by the third (but I think number 3 would look even better with a contrast neck binding). oh this is cute! somehow that fabric just works perfectly. I squealed with delight when I saw the pic of your dress on Instagram, I love that print! With the black binding it’s just perfect. Love it when a quick knock up of a pattern ends up being brilliant! I love the black binding, makes it a bit graphic and tough! I like the middle version, but with the fabrics reversed?! I enjoyed this post! I love your version of the Centauree, sometimes I think that the bodice piecing looks a bit weird on that dress but yours is great. After your Shaukat post I went online and bought that Graham Coxon print too, thank you for enabling that purchase! I was thinking about making an Archer with mine. A Centauree would be lovely too though, and the crepe idea is a good one. Can’t wait to see it made up, whichever version you go for. Thanks! Yes personally I’m not sure about the versions some bloggers have done with the two side panels in a contrast fabric (so I think that discounts my middle version). 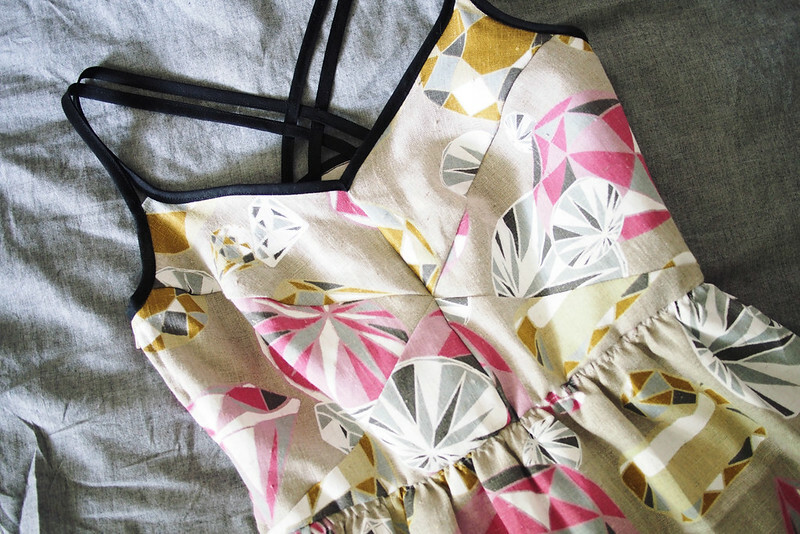 I love the print but it’s just a little too pale for me to consider as a solid top. d) I like the two outer mockups of your next version of this dress – I like the pretty fabric making up the skirt. 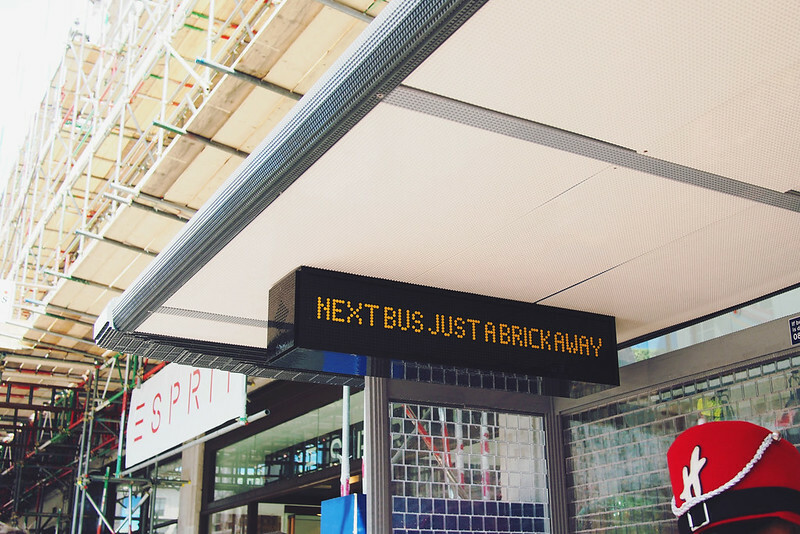 e) Lego bus stop WHAT!?! Haha, it was a pretty great Sunday all round! I was underwhelmed when I first saw D8D’s Centaurée. The photos made me think that the bodice, while interesting in terms of construction, was not very flattering. Your dress has totally made me change my mind. What a fantastic dress! And the texture of this fabric gives it an extra something. Total win. I was underwhelmed too, the plain beige sample didn’t help and I thought it would be a pain to fit the bodice. Glad I was proved wrong! When I first saw this pattern released I didn’t like it that much, but your version is fantastic. It looks to me to be the type of style that needs a stiffer fabric to look good. Love the print too, I bet you’re pleased it wasn’t deemed suitable for curtains now! 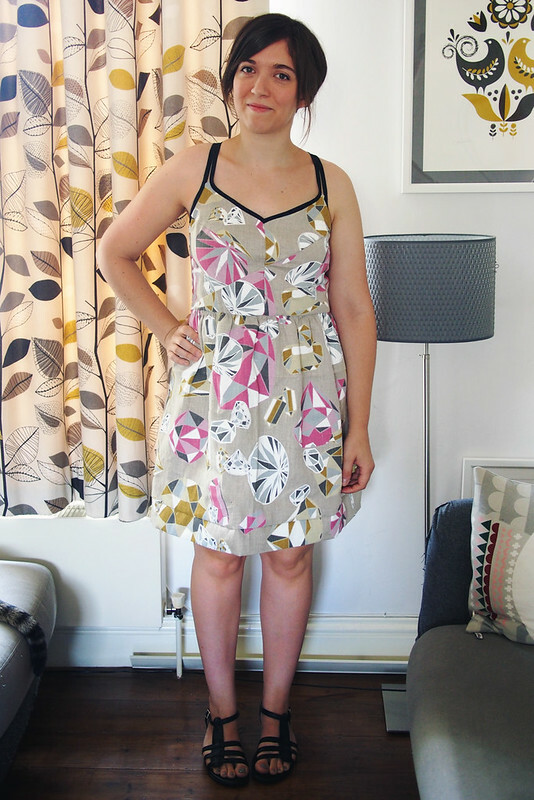 I agree, I didn’t like the plain sample dress at all but I think it comes alive in a print. This is probably my favourite Centauree Ive seen to date – amazing! Of the colour blocked options, Id do 3…but they all have something so good luck with deciding..hahaha. Love this dress on you – super cute! And that fabric really makes it. I agree with Colette – I like the middle mock-up but with the fabrics reversed. But I also love seeing how we all like different things. Doesn’t look like you’ll be getting any kind of consensus here! Thank you. Haha, yeah, so unhelpful! But at least they all have backers so I can’t go wrong really. Leaving towards 1 myself now. This turned out really cool! The print is fabulous in that seamed front. I would never have thought to use a print like this for a dress like this. Lining with stretch mesh is also a great idea. 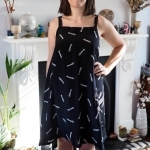 Great dress – I wasn’t sure about the seaming when I first saw the pattern, but this looks really good! I like the middle version in your trio of sketches. Really adorable dress! So cute for summer, love your necklace with it too! Your third photoshop mock-up makes me want this pattern – it’s the take on colour blocking that bodice that just makes this dress ‘click’ for me. So I’d totally do that! Love how your toile turned out so fabulous – the print suits it down to the ground! I can’t decide if that one would look weird or flattering! Ahhhhhhh, this is so cool! I am so loving this pattern, and your diamond version makes me want it even more! Love what you did with the straps, too! Lovely dress! 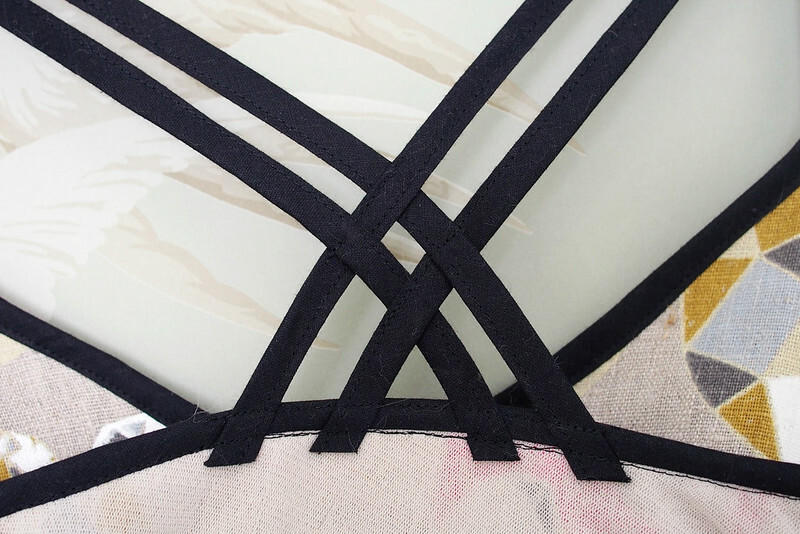 Love the cross over straps especially! 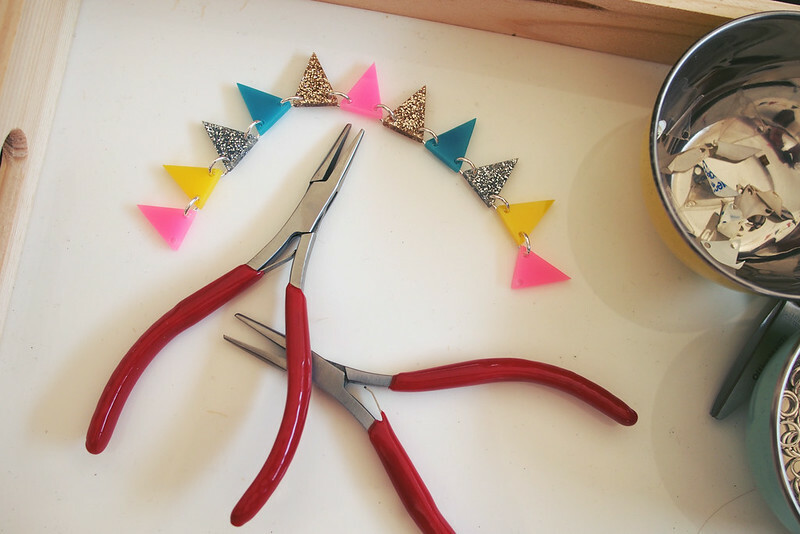 The Tatty Devine crafternoon looked amazing, though the bunting looks like it could be scratchy, total Old Lady alert over here! Oh no, it’s very smooth! Can’t feel it at all when wearing it. What a lovely dress! 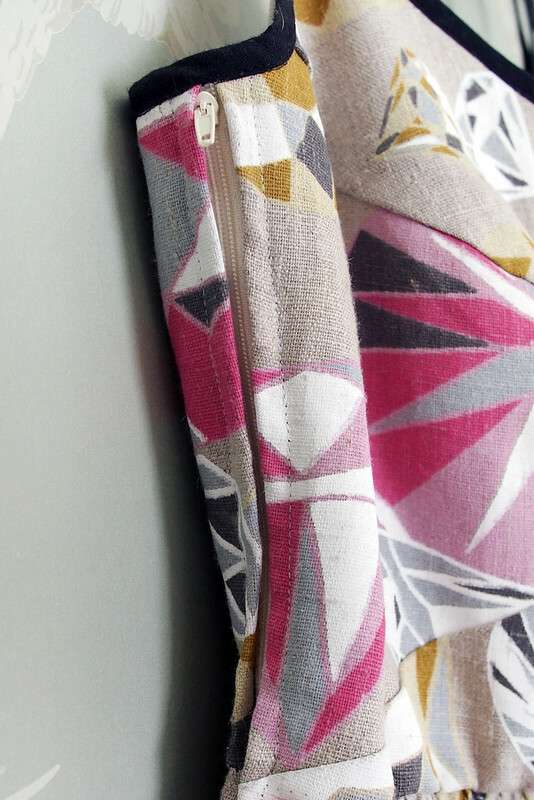 I love the crazy diamond fabric, so colourful and perfect for summer! Can’t wait to see your next one! This is absolutely lovely lady. Love this! 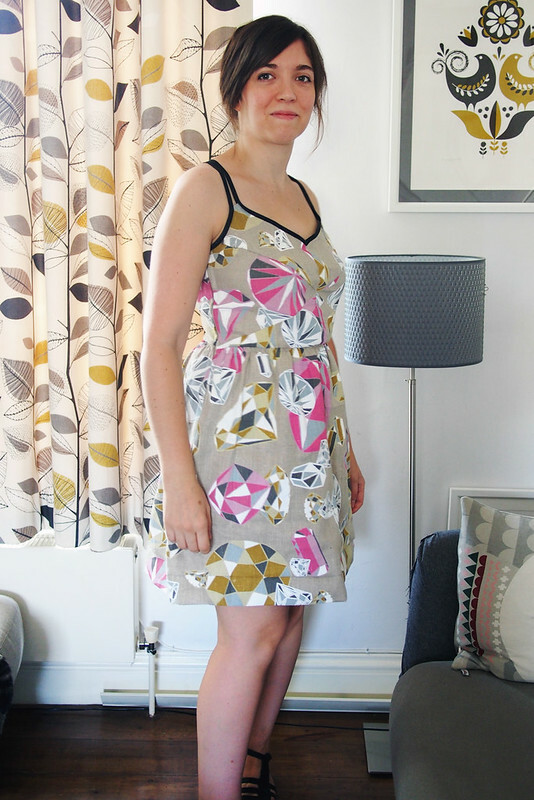 The fabric is ace I would totally have made it curtains but its much nicer as a dress! This turned out amazing! I love that print and I think I may need that pattern now! For your next one, I love the idea of the color blocking on the far right. 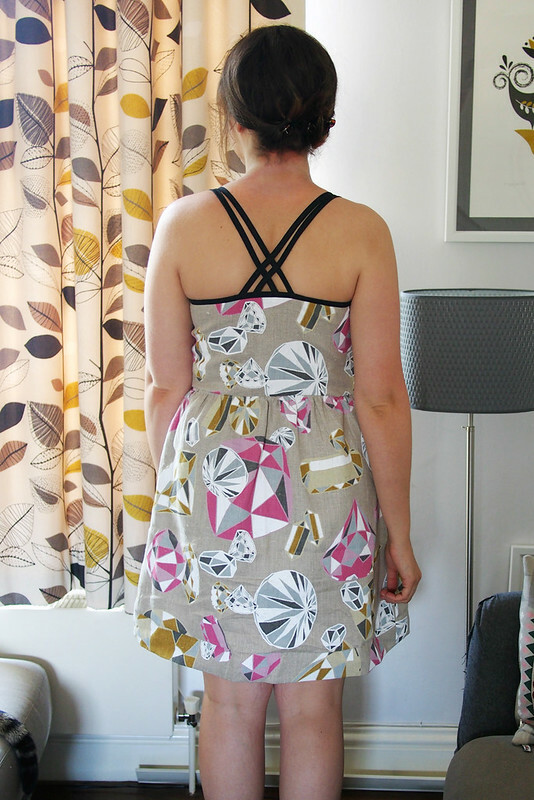 Maybe you could make bias binding out of the print for the straps and neckline to tie it all together? This is adorable! I love an unexpected awesome garment. The stretch mesh is SO SMART, I’m going to have to try that in the future. It’s the worst when your lining has a whole bunch of seams and you just want smoothness! I vote 1 or 3 for the colour blocking. I just love this Katie! I can’t believe that fabric choice wasn’t thought out, it’s such a perfect match! 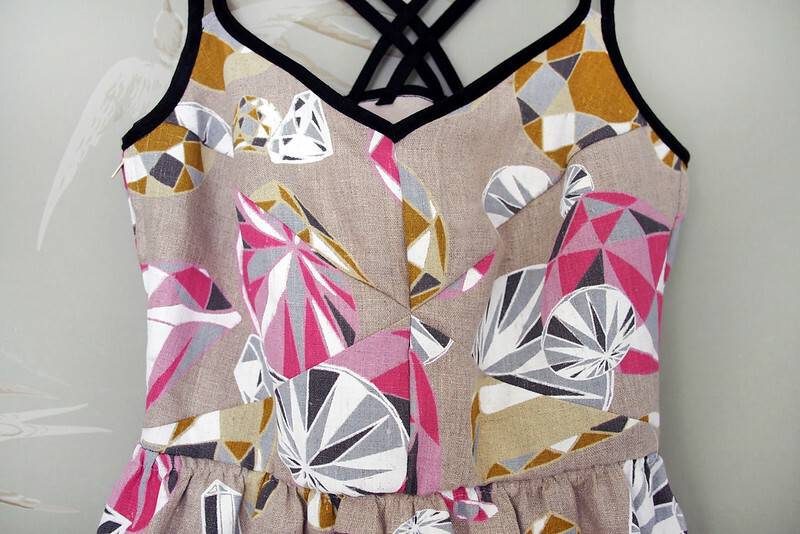 The piecing of the front bodice kind of reflects the formation of the diamonds in the print, gorgeous! That dress is wonderful! The black trim really is a perfect final touch. 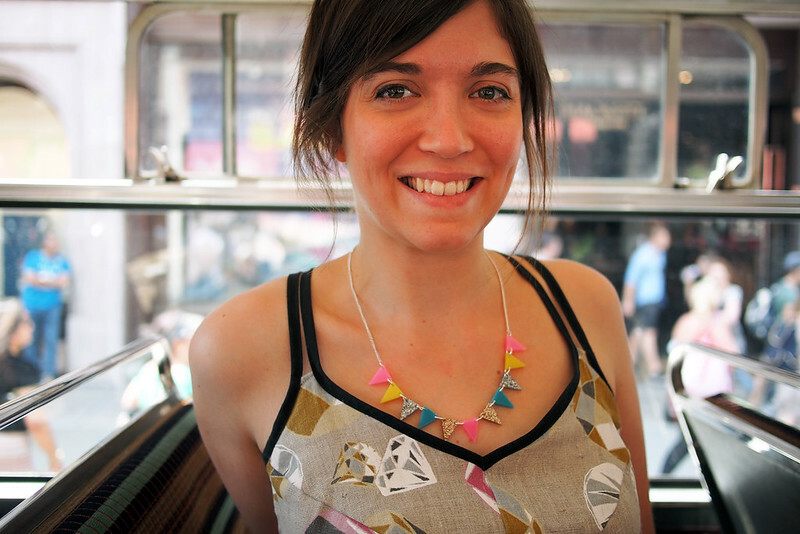 :D The necklace you made looks great with it too!